Although there was plenty of coverage on the 2006 PlayStation Business Briefing on March 19th, it seems as though almost everyone missed one very important slide. 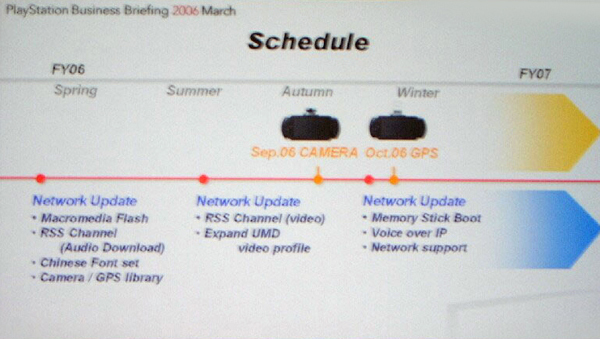 The slide, screenshot above, was Sony’s Schedule for the PlayStation Portable (PSP). This slide outlined when and what SCEA plans to release for the unit throughout this year. According to the chart Macromedia Flash support, downloadable audio through the RSS Channel, Chinese Fonts, and Libraries for the Camera/GPS should all be available in Spring 2006. SCEA then plans to release another update that includes a RSS Channel with Video and expand UMD video profiles by the end of Summer. Sony has already set September 6th as the launch date of the PSP Camera and October 6th for the PSP GPS module. Finally, one more update which allows Booting PSone games from Memory Sticks and having VoIP support should be released by the end of the year. Lets hope that SCEA sticks to this schedule and release new firmware that open up the PSP to more content than restricting it like they have done in the past. Check back soon for more information and PSP news.